Hurricane Irma hit the shores of Cuba on September 7, a category 5 storm with sustained winds of 295kph. For four days, Irma battered the north coast of Cuba. 2,000,000 people fled to shelters, churches, or the homes of relatives and neighbours. 9 metre waves swept inland, contaminating fresh water sources, destroying crops, homes and businesses. Coastal dunes, forests, fruit trees, granaries, health centres, schools, markets, bridges and roads were all heavily damaged or destroyed. Power and communications went down and remain down in many communities. 10 people lost their lives. 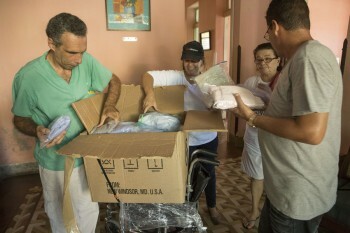 The ACT Cuba Forum is responding to the widespread humanitarian need, targeting 20 municipalities in 10 provinces in a $2.5 million USD appeal which will bring water, sanitation and hygiene (WASH), food, shelter, livelihood recovery, and psychosocial support to 20,000 households, reaching 100,000 Cubans. The ACT Appeal, will help 800 families to repair the roofs of their homes, provide household supplies to 3000 families, 4100 households will receive food, 5000 households will receive hygiene kits and awareness raising about good hygiene practices, 2250 households will have access to clean water through community water systems, 500 households will have support in restoring their livelihoods, and 20,000 households will receive psychosocial support in coping with the trauma of the experience of Hurricane Irma. The ACT Forum will coordinate with community and church leadership, local governments, the national government as well as the UN Network (including national and international organisations responding to the emergency). The full ACT Concept Note is available here. ACT members in the Dominican Republic and Haiti are also responding to the damage caused by Irma in their countries, although both countries were spared a direct hit by the storm. Both the Haiti and Dominican Republic Forums will be supported by the ACT Rapid Response Fund for their work in providing relief to those affected by Hurricane Irma.